Guys if you have been reading my blog, you would have seen I attempted to make jewellery. This time I am with a new DIY. I had a neckpiece, which I wore just once. You heard it right just once. I don’t know why did I in the first place buy it. So I thought I should revamp its look. I did a little something to it and now I am loving it and cannot wait to wear it.Gia from ‘Gia says that’ had done the same thing. And I extremely loved it. If you have some old jewellery on a new one which you don’t like, pick it up. Take a nail colour. I was dicey between neon pink and a minty colour. I actually wanted to colour it pink, but did not have enough paint, so I rather went for a minty shade. If you see my outfit post, you would notice I love this colour. 1) Take the neckpiece and first wipe it with a clean cloth. 2) Choose the nail colour and apply it with the nail paint brush itself. You will definitely need atleast 3 coats. It depends on the colour. Wait for a few minutes before applying the next coat. 3) Do not be impatient like I was and let it dry. Tada…. The new neckpiece is ready. The next time I am going to try using fabric acrylic colour instead of the nail paint. If you liked the DIY, let me know. 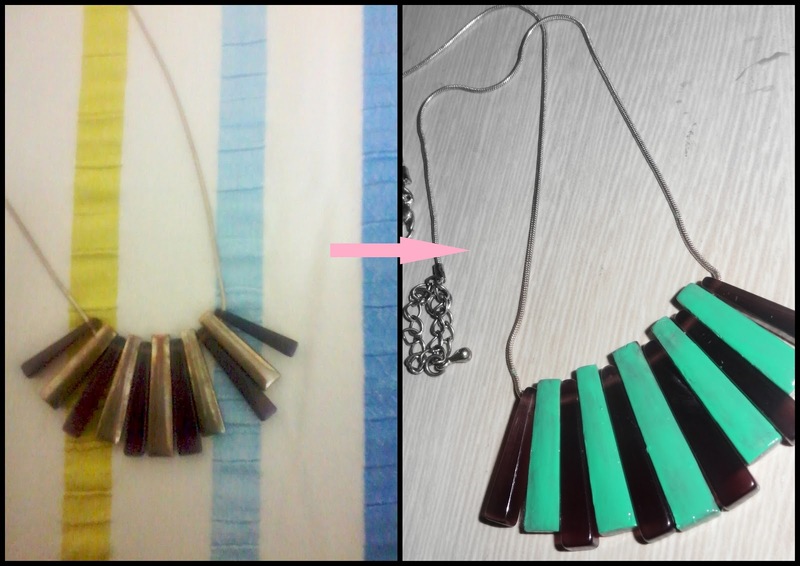 I shall do more DIYs in future.